easycook is a practical, down to earth and straight-talking food magazine. It aims to help busy people feed their families with a minimum of fuss and effort during the week, with more adventurous ideas for when there's a little more time at the weekend. The easy, speedy and healthy recipes are ideal whether you're an experienced cook or you're less confident in the kitchen, and they're all thoroughly tested so they will always work first time. 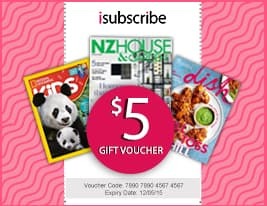 In every issue; over 100 speedy, easy to follow recipes, family recipes for every day of the week, food kids love, store cupboard ideas, easy entertaining and easy baking. Be the first person to tell us what you think about BBC Easycook and you'll save $5 on your next purchase!